"You were right darling. The light does go out when you shut the door." World hide and seek champion. Pablo had some serious shelf esteem issues. No one puts Davey in the corner. "Mum! The handyman from Narnia is here again!" "Hi, your wife needed a screw." Dave was still a bit shy after recently coming out of the closet. One of those elf assembly kits. The conservatives suffer heavy losses in the latest cabinet reshuffle. Some of the workers were lucky enough to get on site accommodation. A prop for Penn and Teller. "Wow, you must be flexible"
"Well I can do Tuesdays and Thursdays"
Good Morning, would you be interested in joining Jehovah's Witness?. Mom..where did you put Uncle Ben? What have you done with old mother Hubbard? "There's no escaping the bill Detective Burnside." Hubby goes there, and Mum-in-law in the basement. "Mum, call Rentokill- we've got builders!" Policeman pointing gun: "Don't move, Ivan. We knew you'd be tooled up, the tallboy squealed." "I've got Harry Potter beat, cupboard under the stairs my foot..."
Blow-up dolls are so life-like nowadays. You've got to be a very small fitter to work for Wren Kitchens. Though lots of stuff had gone missing, Dave insisted he'd been fitted up. 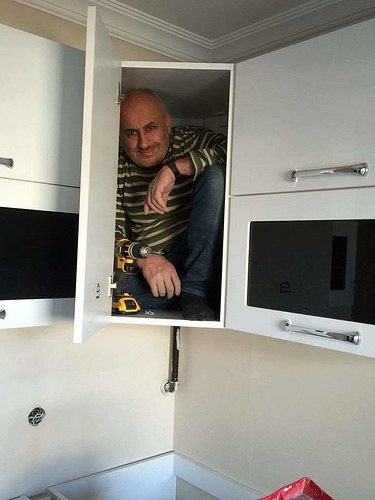 Kitchen comes with built-in Micro Dave, the handyman who takes care of all your DIY needs. This is the third time this week ....... could my wife be having an affair? "For goodness sake darling....why would you put my tabasco sauce behind the handy man???"